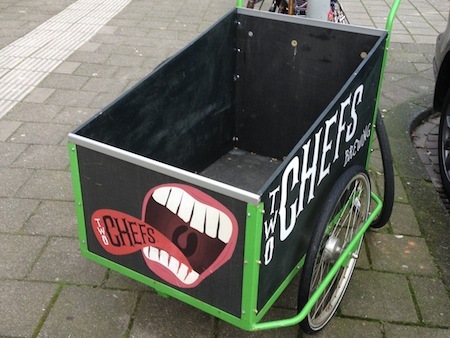 dutchgrub | good amsterdam food from a trusted source - not a vending machine. Posted by dutchgrub	on Monday, November 17, 2014 at 21:36. 1 Comment. The number of Michelin stars in Amsterdam keeps growing. The number has now gone up six years in a row. And rather fast recently, from 11 stars in 2012, to 15 last year and a total of 20 this year! The biggest contribution to the total this year came from Librije’s Zusje – which as its name suggest is the sister restaurant of three star Librije, located outside of Amsterdam. Bord’Eau, after entering the list last year, climbed to two stars, while Ron Gastrobar gladly sacrificed one of its stars to change to a more informal style. Then there were three restaurants that received their first star, Bridges, also affiliated with Ron Blaauw, Sinne, one of the few cozier Michelin restaurants not based in a hotel, and Japanese Teppanyaki restaurant Sazanka. CNN has this great show called CNNGo. It’s a travel show where a number of locals show TV viewers their favorite part of a city. This month’s show is about Amsterdam and we got to be co-hosts and tell the audience all about Amsterdam street food. The video is great fun so watch it below and let us take you to Pancakes, Vleminckx French fries and Brouwerij ‘t IJ. Our Best Amsterdam Brunch List has been immensely popular and also due for an update. When we started the list in 2012, good brunches were much harder to find, and we were thankful for Lovefood to open doors, first as a pop-up and later as a daily brunch. Well, Lovefood has come and gone, but today there are quite a few good brunch options. We are delighted to have added Kiwi-run Bakers & Roasters as well as Aussies Little Collins to our list. With Dutch brunch and lunch favorites Gartine and Brits Greenwood’s still going strong – both original list members – the list is just as international as Amsterdam itself. Craving for many varieties of eggs and great coffee? 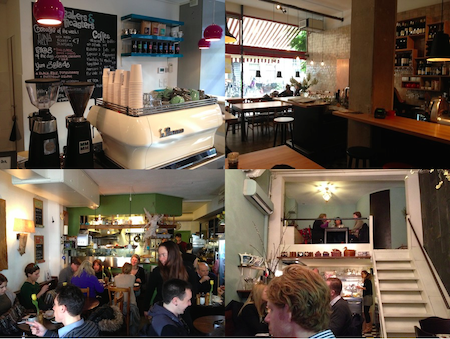 Check out our Best Amsterdam Brunch List and head over to one of our favorites! 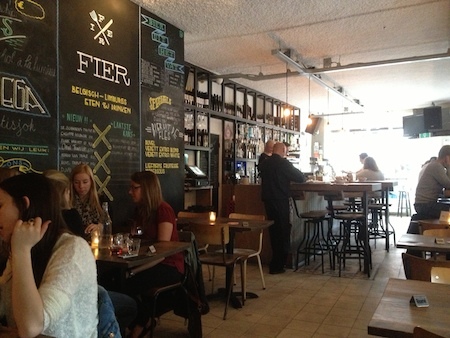 Restaurant Fier – as in French for proud rather than Dutch for four – is uncomplicated dining Belgian style. The menu is simple. There are six choices on the menu, all tried and true comfort food favorites: Burger, chicken, hangar steak, pot roast and a daily fish and vegan special. 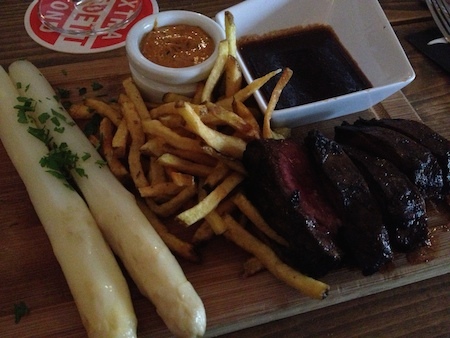 Each is accompanied by a choice of different style of French fries, veggies or salad, and four sauces. 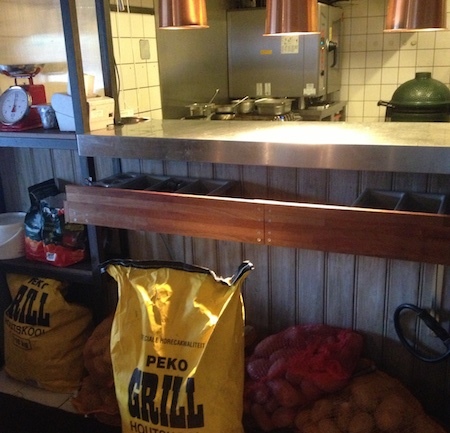 Most of the food is cooked in the Big Green Egg – an ever more popular combined grill, oven and smoker. It turned out lovely smokey chicken, juicy burger with lots of truffle sauce, and succulent rare, almost blue hangar steak. The opening hours are convenient. Every day from 10am to 10pm for breakfast, brunch, lunch, dinner and drinks at the bar until late. The service is quick and friendly, the tap water put on your table right away without having to ask for it, the wine list short but adequate, with all wines available per bottle or by the glass, and the beer options vast. The decor is simple with bare brick walls, a semi-open kitchen, a long bar and also ample seating outside. And prices are quite affordable at € 16,- for any of the main courses. We dined quite comfortably and without any complications! The NeighbourFood Market is kind of a flea market of caterers, all making different kinds of food from all around the world to be consumed right then and there. It takes place once a month on a Sunday at the Westergasfabriek. 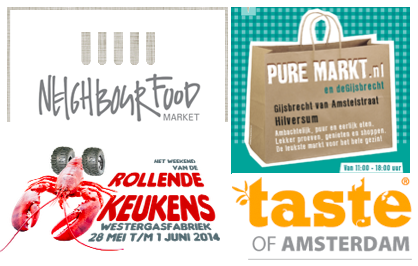 The Pure Markt takes place every last Sunday from 11am to 6pm of the month Park Frankendael. It’s focused on producers of organic and regional food products. The rolling kitchens festival brings all sorts of food carts to the Westergasfabriek for a weekend of yummy street food. Taste brings together some of the best chefs of the city for a weekend of cooking and sampling. Admission is € 9,50 and a taste of a signature dish of restaurants like Michelin stars &samhoud places or Aan de Poel as well as many others is between € 5 and € 7,50. 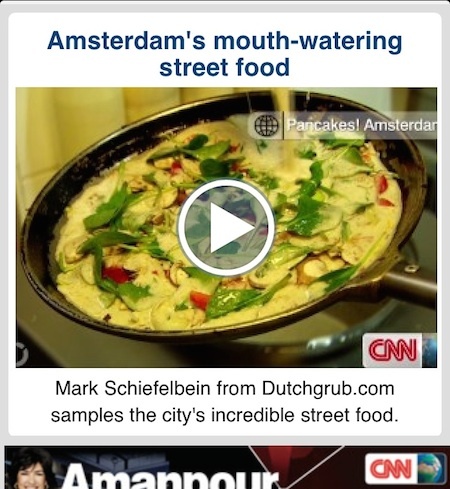 One of the questions we get asked the most is “what are the latest trends of the Amsterdam food scene?”. And while we would love to come up with a surprising and insightful answer every time, that’s not how it works. It’s usually some rather unexpected event that triggers us to recognize a new trend. And so it happened last weekend on a trip to our favorite wine and liquor store Ton Overmars. 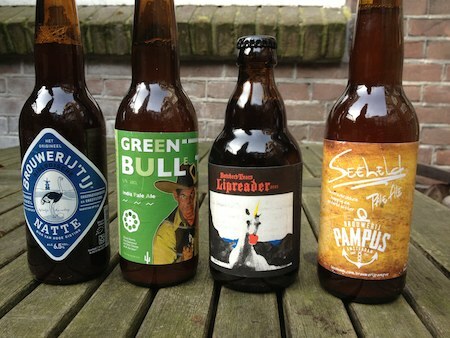 There are a lot of new local microbreweries in Amsterdam! It’s not that there were no microbreweries in Amsterdam before. Actually, Brouwerij ‘t IJ has been around since 1985, and we have enjoyed many of their tasty brews throughout the years, especially on their lovely terrace by the windmill in Amsterdam Oost. 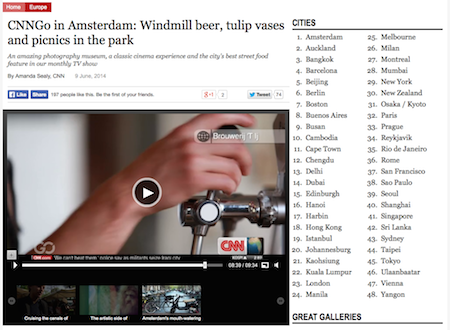 And it wasn’t just us, as Brouwerij ‘t IJ has been very successful. They extended their tasting room a few years ago and opened a second brewery in early 2013. So today you can find their distinct ostrich logo (a pun on IJ and ei, which means egg) in many bars and shops, and enjoy their regular selection of brews as well as seasonal specials. Equally successful, although not around for quite as long, has been Brouwerij de Prael, another established household name in beers in Amsterdam, with its selection of beers named after Dutch chanson singers and tasting room smack in the middle of the red light district. Given their success, and the microbrewery craze that swept the US, it’s probably surprising that nobody else was concocting fresh IPAs or mean Belgian Tripels around Amsterdam. But that has changed now. Over the last two years Brouwerij Pampus, Two Chefs Brewing, and Butcher’s Tears have started brewing, and we like what we taste! The self-proclaimed old salts at Brouwerij Pampus spent much of 2012 and 2013 experimenting with different brews, gathering extensive feedback through their Facebook page and participating in countless beer festivals with a wide variety of beers. All their beers seem to follow a sailor’s naming scheme, such as the Drenkeling (drowning person), a Juniper Ale, or Seeheld (hero of the sea), an IPA that we quite liked for its bitter yet somewhat unexpected but lovely creamy flavor. Two Chefs Brewing also started in 2012. Coming from a background as professional chefs and looking for interesting flavors they are on a mission to put more barley, more hops and just generally more flavor back into beer. So far they have made available an IPA called Green Bullet, which indeed is heavy on the hops. 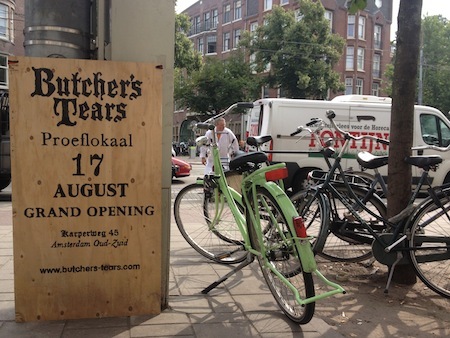 The last newcomer is Butcher’s Tears, located in small-scale industrial zone by the tram depot in Amsterdam Zuid. The tasting room and website look distinctly grungy, but there seems to be a rather professional organisation behind it if the range of beers and the list of distribution points are any indication. We liked hanging out in their tasting room where both the Night Cap, a smooth pale ale, and the refreshing Green Cap went down well. Quite a nice list if we may say so! But there appear to be even more such as Brouwerij De 7 Deugden, which provides work opportunities to disabled people, Jopen, the pride of Haarlem, or Oedipus Brewing who are currently looking for investors through a crowfunding platform.